Kofi A. Annan was the seventh Secretary-General of the United Nations, serving two terms from 1 January 1997 to 31 December 2006 and was the first to emerge from the ranks of United Nations staff. In 2001 Kofi Annan and the United Nations were jointly awarded the Nobel Prize for Peace with the citation praising his leadership for “bringing new life to the organization”. 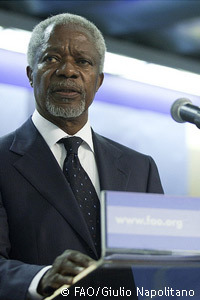 Since leaving the United Nations, Kofi Annan has continued to press for better policies to meet the needs of the poorest and most vulnerable, particularly in Africa. He has also continued to use his experience to mediate and resolve conflict. In Kenya in early 2008, Mr. Annan led the African Union’s Panel of Eminent African Personalities to help find a peaceful resolution to the post-election violence. Kofi Annan is the Chairman of the Kofi Annan Foundation, of the Africa Progress Panel (APP), and of the Elders, and used to be Chairman of the Alliance for a Green Revolution in Africa (AGRA). He also currently serves as the Chancellor of the University of Ghana, and is a board member, patron or honorary member of a number of organizations..
One of Kofi Annan’s main priorities as Secretary-General was a comprehensive program of reform aimed at revitalizing the United Nations and making the international system more effective. He was a constant advocate for human rights, the rule of law, the Millennium Development Goals and Africa and sought to bring the organization closer to the global public by forging ties with civil society, the private sector and other partners. Mr. Annan undertook wide-ranging diplomatic initiatives. In 1998, he helped to ease the transition to civilian rule in Nigeria. Also that year, he visited Iraq in an effort to resolve an impasse between that country and the Security Council over compliance with resolutions involving weapons inspections and other matters – an effort that helped to avoid an outbreak of hostilities, which was imminent at that time. In 1999, he was deeply involved in the process by which Timor-Leste gained independence from Indonesia. He was responsible for certifying Israel’s withdrawal from Lebanon in 2000, and in 2006 his efforts contributed to securing a cessation of hostilities between Israel and Hizbollah. Also in 2006, he mediated a settlement of the dispute between Cameroon and Nigeria over the Bakassi peninsula through implementation of the judgement of the International Court of Justice. His efforts to strengthen the Organisation’s management, coherence and accountability involved major investments in training and technology, the introduction of a new whistle-blower policy and financial disclosure requirements and steps aimed at improving co-ordination at the country level. Mr. Annan joined the UN system in 1962 as an administrative and budget officer with the World Health Organization in Geneva. He later served with the Economic Commission for Africa in Addis Ababa, the UN Emergency Force (UNEF II) in Ismailia, the United nations High Commissioner for Refugees (UNHCR) in Geneva and in various senior posts in New York dealing with human resources, budget, finance and staff security. Immediately before becoming Secretary-General, he was Under-Secretary-General for Peacekeeping. Mr. Annan also served as Special Representative of the Secretary-General to the former Yugoslavia (1995-1996) and facilitated the repatriation from Iraq of more than 900 international staff and other non-Iraqi nationals (1990). Kofi Annan passed away in Bern on 18 August 2018.